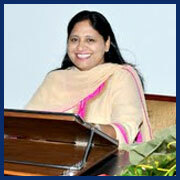 Charming and dignified, Mrs. Sheela Gehlot exudes exuberance in her thoughts and approach to education. A hands-on person herself she encourages experiential learning, as children learn best by doing. Her belief is that every individual should strive towards becoming the best they can be. She feels that apart from the usual business of literacy and numeracy children must learn respect for self and others, problem solving, conflict management and aesthetics in order to become complete individuals. Even though she is involved with all the school activities she feels closest to the children in the Pre-Primary wing and is always looking for new ways to make learning a joyful experience.